Time for something a little different here at Loud. Bruce Prichard is a professional wrestling personality perhaps best known as a manager and producer for World Wrestling Entertainment (WWE). As a manager for the promotion, Prichard performed under the ring name Brother Love. He later became company head honcho Vince McMahon’s right-hand man, and a key part of the company’s creative process for many years. After leaving WWE, Prichard was the senior vice-president of programming and talent relations for Total Nonstop Action Wrestling (now Impact Wrestling). 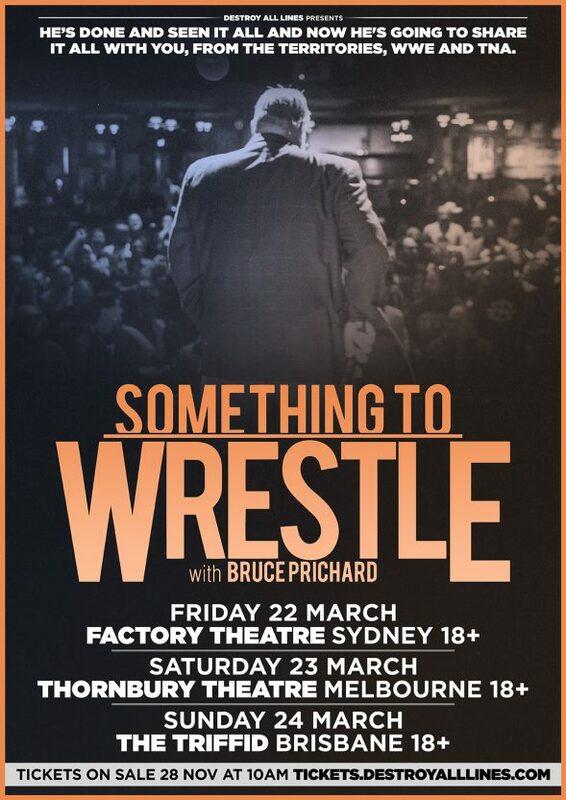 Prichard and Conrad Thompson now co-host a highly successful podcast; the award-winning Something to Wrestle With Bruce Prichard which began in 2016. Prichard has been there and done everything in the industry, and he has plenty of stories to tell. Loud chatted with Prichard ahead of his first ever Australian live show tour. (Note – since this interview was conducted, Prichard has returned to work for WWE after a lengthy absence). Q: You’re headed to Australia for the first time in March, and were recently in the UK. When you launched the podcast, could you have envisioned that the show would take you around the world? A: (Laughs) No, I never did. First of all, I never envisioned the kind of response that we have gotten, and just the fact that people care. So to say that people are actually listening to the show and that it has actually transformed into a live event where we travel all over the world now, and do shows in front of live audiences is absolutely incredible. Q: So I understand the show’s genesis stems from you working with Conrad in a non-wrestling related field after you left WWE? A: We were doing mortgages together, and we would always sit and talk about wrestling. I told him a story at one point and he said, ‘man, that’s a podcast’. And I laughed and told him I didn’t think that was something that would ever happen. I wasn’t even really sure what the hell a podcast was. But we did it, and we did it to advertise and to sell mortgages. And it grew from there, and it kind of absorbed my life, that’s for sure (laughs). It started to become very successful, and we weren’t just selling mortgages; we got a few advertisers and were able to move it in that direction. Q: And you have a whole merchandising mini-empire associated with the podcast as well. A: Yeah, we do the T-Shirts, and we do a lot of different things, and the live events. So it’s spawned off quite a few ancillary businesses on the side. The T-Shirts over at bruceprichard.com, they’re a lot of fun and we come up with sayings and different scenarios on the show. It always tickles me whenever I go to a convention or an event, and people want to buy shirts there. That’s a pretty humbling sight. A: It’s definitely there, but it comes from a place of, he’s only ever heard one side. And his side that he heard for the most part is usually from people who weren’t there, who have zero real knowledge of these situations, and they’ve never been debated before. No one on the other side has ever said, ‘no, that’s not what happened. Here’s what really happened’. So for his entire life, all he’s ever known is what some guy sitting in his basement in California on a typewriter, getting phone calls from disgruntled employees and fans who purchased tickets to events, and listening to them and taking their word as the gospel as to what happened. So when he hears something else and the only thing he’s ever heard is that, the initial reaction you have it in ingrained in your head is, ‘this is what happened’. So then somebody else says, ‘no, that’s not what happened at all’, he gets frustrated. I think part of the frustration is when he realises that his source of people that have written these gossip columns for all these years are not as factual as he might have thought. Q: I think that fiery back-and-forth is part of your unique chemistry though and the way you play off of each other – much like his show with Eric Bischoff. A: Absolutely. Because again it comes from a place of, we were there, we actually experienced it and a lot of times we were the ones making those calls. So I know why we made those calls. Or I was sitting with Vince and I understand why certain decisions were made. And first-hand, not from what somebody who thinks they know, from the outside, just thinks. It’s a big difference. Q: The consensus seems to be that the live show is an opportunity to tell stories that can’t be revealed on the podcast. Is that how you approach it? A: Absolutely. The live show, it’s going to be a solo show in Australia. It will be me by myself, but it’ll be a little more intimate, talking a little more about my history and things in my career. I am going to tell the stories that we can’t tell on the podcast, and go into things that the audience wants to hear about. It’s very interactive, we do a lot of audience participation, so that they can ask me what they want and then I’ll take whatever direction they’re going and try and veer off, and tell some stories in that way. We’ll get a little music involved in there, a little singing and some dancing even. The main thing is it’s going to be a lot of fun. Q: I recall recently a show focusing on WWE legend Jerry “The King” Lawler, whereby the legal troubles he experienced during the ’90s were referenced. Do you ever come upon topics whereby for whatever reason you can’t discuss due to some form of legalities? A: As far as if there was something legally that I was involved in that I would be precluded from talking about, I try to stay clear from that. I also try to stay clear of a lot of the rumour and accusations that are just made flippantly, without anything to back them up. And there’s a lot of that just in the wrestling business. So I try to stay away from some of that. I’ll say, ‘okay, you can bring it up, but I’m going to shoot it down’. But for the most part, that’s the rule of thumb. And the things that we don’t talk about on the podcast are sometimes things to do that are maybe a little more salacious, or having to do with some drugs and things like that which I don’t normally talk about on the podcast. Q: Changing topics, you started with the WWF in 1987, so would you probably have just missed the peak ‘Rock ‘n’ Wrestling Connection’ years. But why do you feel rock ‘n’ roll and wrestling have usually combined so effectively? A: Well, it’s a perfect combination because it’s pretty much the same audience. It’s a young audience, they love to go out, they support their music and they get into it. And I think the wrestling was another place where they could get lost. They could go in, they could support their favourites and boo their not-so favourites. So it was a natural. And I go back to, for so many years, here in Houston, ZZ Top is from Houston. They used to love to come to the matches, they were fans and they wanted to be part of it. And Debbie Harry from Blondie in New York, she was always there. It’s a natural. It’s the performers, they love the performance and respect it on both sides. So to me it was always a natural deal, and for me, going back my favourites as far as music goes has always been AC/DC and Aerosmith, and I also go country too. But I think if you were to have an official band of the WWE, overall I think it would probably be AC/DC, that (band) everyone universally got and liked. A: I hope to see everyone there, and to anyone who’s coming out – it’ll be an awful lot of fun. It’s on my bucket list to come to Australia. I cannot think of a place that I have been more excited to visit. It’s just one of those places I’ve never been, and have always wanted to go.